Top seed Taylor Townsend forced to retire. For the second straight day, Asia Muhammad had a second-set letdown after winning the first, but rallied to come back and win the third set as she beat Canada’s Katherine Sebov on Thursday Canada, 6-1, 5-7, 6-1, to advance to Friday’s quarterfinals at the Central Coast Pro Tennis Open taking place at the Templeton Tennis Ranch. A 10-year veteran of the WTA and USTA Pro Circuit Tour, the 27-year-old Muhammad has always prided herself on being one of the fittest players on the pro tour. Currently ranked No. 210 in the world in singles, Muhammad is also a Top 100 doubles players in the world and later in the day won her doubles match to advance to the semifinals as the top-seeded team with partner Maria Sanchez. Muhammad next faces Swiss qualifier Amra Sadikovic in the quarterfinals on Friday. Muhammad’s doubles partner Sanchez joined her in the singles quarterfinals following her 6-3, 6-4 win over Norway’s Ulrikke Eikeri. Like Muhammad, Sanchez has seen her best success in doubles peaking at No. 56 in the world in doubles in September of 2016. She won a WTA doubles title in 2014 in Auckland, New Zealand, with Sharon Fichman and holds 21 USTA/ITF Pro Circuit doubles titles, the latest coming at the $100,000 grass-court event in Ilkley, Great Britain, this June. The top-seeded Taylor Townsend was upset on Thursday as she was forced to retire from her second-round match against Bulgaria’s Sesil Karatantcheva, down 6-0, 3-0. In two high-profile All-American matchups, No. 2 seeded Madison Brengle beat Lauren Davis, 6-3, 6-2, and unseeded Grace Min got past rival Jessica Pegula, the tournament’s No. 4 seed, 3-6, 6-3, 6-1. Sesil Karatantcheva, Bulgaria, def. Taylor Townsend, U.S., (1), 6-0, 3-0, ret. 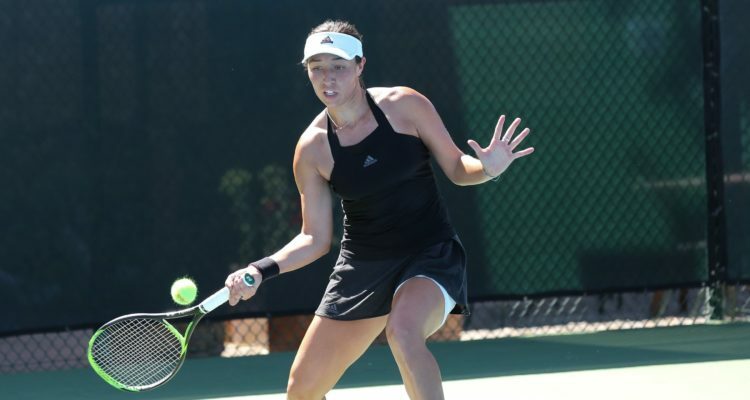 This entry was posted in ITF World Tennis Tour and tagged Central Coast Pro Tennis Open, ITF Pro Circuit, Jessica Pegula.